Sowell Life: I'm not ready... or am I? I have always stated that I would never be one to own a mini van, but sometimes you have to go for what is going to work best whether you are ready to admit it or not! :P Good luck with your decision. I don't own a mini van-- but a lot of my friends with kids do. 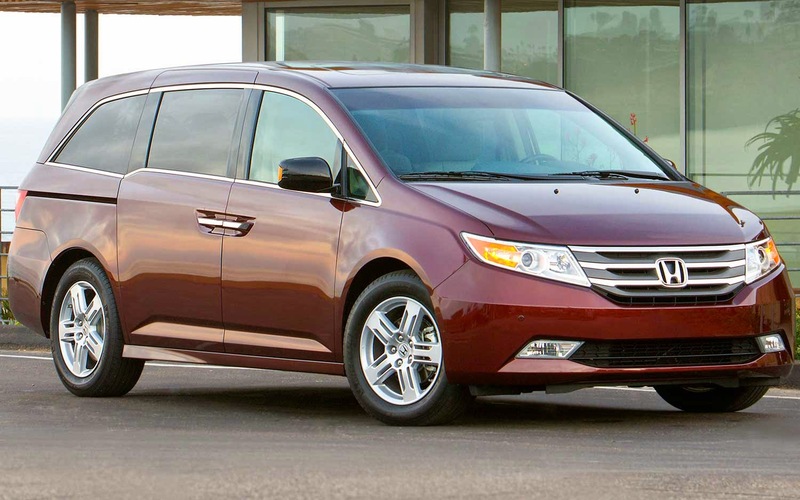 The two everyone loves: Chrysler Town and Country and the Honda Odyssey. My friend calls her mini van a mom's tail gate car because it has lots of cup holders :-)-- so perfect for y'all during football season. I do think mini vans are easier to get around in (on the inside)- from when I was a Nanny years ago... although I'm with you girl-- not sure I could make the jump! Do you think as Avery gets older you don't need to be in the back as much? They say with a second kids, mom's get a little more relaxed about sitting in the back, etc and so forth. But do what is right for you! That's so funny because we are going minivan shopping this weekend. I've always said noway but now with 3 kids I don't see any way around it. We've narrowed it down to a Sienna or an Odyssey. Hi Joy! Congratulations on baby number 2! My hubby talked me into a minivan too, and I LOVE it! We got the Dodge Grand Caravan, but also test drove the Honda. We chose the Dodge because all the seats stow and go, whereas the middle seat in the Honda can be removed, but doesn't stow into the van. I absolutely love the remote start (came with it) and my favorite is the heated steering wheel! It makes everything easier - grocery trips, Costco trips, family weekend getaways. And the Dodge is spacious enough that my baby's rear-facing carseat (she and AC have the same one) fits behind the driver's seat and my hubby (who is 6'5") can still sit comfortably when he drives. Good luck and I'm sure whatever you end up with, you'll love! Everyone I know that has a mini van swears that it is the best car they've ever had. I agree, though, it's a big jump to make! We're expecting #2 in July and I don't know how two car seats will fit in our Rogue and Rav4. It might be time for a change for us, too. I drove a mini-van in high school and missed it ever since. I was more than happy to make the very adult mini-van purchase. It's really nice! And even with the kids in there, there's still room for other people or my mom, which is way convenient. Good luck in your decision! That above comment was me, not Spencer. I forgot to sign him out! I got a van last year when I was expecting Liam, and it's been the best decision! Our Honda has captain seats for the 2nd row, but also a middle seat that can be removed-which is what we do right now. On our trip to FL last week, I rode in the 3rd row so I could entertain/feed/give paci's easily. It was great! We LOVE our Honda! I used to be 110% in the same boat with you like heck no I'm absolutely not going to be a minivan mom no way. But then we rented a minivan when we moved from Wisconsin down here and were living in hotels for two weeks because it only made sense since we had our dog too. And now I'm not totally on board yet but I wouldn't say no right away. My best advice? Rent one for a few days. Seriously huge purchase that you don't want to hate since you use it everyday.